For the first time in history, the population living in cities has surpassed the rural population, and this trend is increasing every day. And according to the UN in 2050 the urbanites will be 70% of the population of the planet. We have entered a new era. The Urban Era Cities are today the engines of economic development, innovation catalysts and investment multipliers (they already account for 70% of GDP). But they also face serious problems arising from increased pollution, high noise levels, excessive resources consume, CO2 emissions, congestion, spending of time, etc. These both sides of the coin, makes necessary to work for mitigate the negative effects of urbanization and enhance the positive ones, and the only way to do this is through a good urban and infrastructure planning. Faced with this challenge, major cities in developed world are carrying out major redevelopment and Regeneration Urban Land Projects, recovering degraded areas, industrial zones, obsolete or unused infrastructures inside the city, to create new quality vibrant spaces for citizens, parks, housing, offices, shops and urban infrastructures on areas with optimal accessibility and connection around the High‐Speed railway Station. They achieve then to minimize the resources needed (soil, commute, energy and time), and create more compact and efficient cities that face the necessary growth, in a more sustainable way. Milan, Perth, New York, San Francisco, Frankfurt or London have already completed these. Redevelopment Projects and their success is setting an example for other cities like Sydney that is following its wake with a budding macro Project now in planning stage. All these Projects have in common the essence of recovering railway lands for the city, increasing the value o public domain and transforming into public spaces and Real Estate developments that help to self‐financing the expensive infrastructures required. 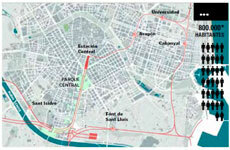 The main Spanish cities have already joined this trend of Urban Regeneration. Madrid aspires to get on this boat with the largest of all the Redevelopment Projects proposed. However, it have been found notable differences between the designed Projects in Spain and those carried out in other countries, which can help us to understand each other and to learn from their successes and mistakes.